According to the NFPA, there are between 350,000 and 400,000 house fires in the U.S. every year and this results in almost $8 billion in annual damages just in that country. Think now the amount in the whole world… scaring right? Those are some scary statistics especially for those of us with families to protect. One of the best things we can do is educated ourselves and our families on what the common causes of fires are and then look for ways to reduce our exposure to the greatest extent possible. There are some causes of fires beyond our control (arson, etc.). 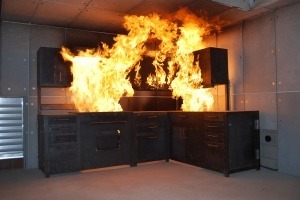 Electrical: speaking of electrical problems, they are another very common cause of house fires. One of the leading culprits is the over-use of extension cords. Surprisingly just because there is an open plug doesn’t mean you can plug just ANYTHING into it. They can actually only safely pull so many watts so be sure to be very aware of the safe amount you can plug into any extension or extension cord. If there is ever a doubt, you are probably much better off to hire an electrician to provide you with permanent wiring. It is also very adviseable to have an electrician perform an annual checkup on your home’s wiring. Smoking: We all probably remember laughing at a relative that was falling asleep in their favorite chair back in the day with really long ashes on their lit cigarette, maybe they jumped a little as the ashes fell on them. Well, this can be somewhat humorous when someone else is watching but in general it is just extremely dangerous. The best thing you could do is shake them and ask them what their problem is and if they actually WANT to burn the whole house down. Candles: they can be romantic, set the mood, or simply just a practical and cheap way to provide light (especially in a power outage). However, for some reason we tend to forget that it is an open flame and that we shouldn’t just leave lit candles unattended (say after dinner, you wander off for a nap and leave the dinner candle lit). This is another great example of common sense and blowing out the candles immediately after they are needed should be made into a ritual, after all it could save your life. Flammables in the House: there are a lot of products left around the home that are highly flammable (especially if the garage is attached to the home). Be careful of where you place any flammable materials (fuels, oils, etc.). Don’t place them next to a possible source of a fire as they can rapidly turn a bad situation into a disaster. The simplest rule is to keep them contained and a away from the home to the greatest extent possible.